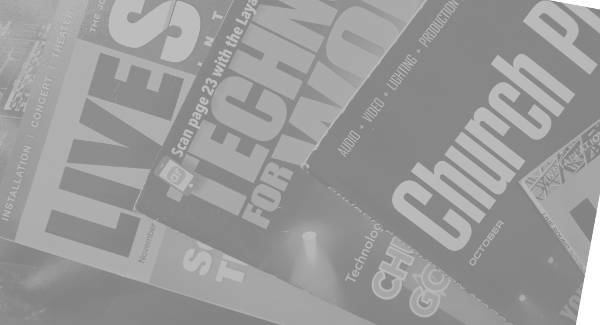 There are six things I wish someone would have told me when I started in church audio production. They’re simple to understand yet, no one talks about them. That ends today. The following is the transcript of the podcast. Check out the end of the article for direct links to the podcast on the major podcast players. I had no idea that was far from the norm. Since then, I’ve mixed at a lot of places, churches included, and I can say, without a doubt, that it doesn’t matter what church or theater or venue you are at, it’s far from what Sheila E. would call the Glamorous Life. One day, I’m standing over a trash can cleaning out the hard crusty wax from a set of in-ear headphones. Another day, I’m mixing the service and there, a row ahead of me, are two people talking through the worship music. And then there are the days of dealing with requests to raise the temperature, lower the blinds, or provide directions to somewhere within the church…all within ten seconds of the service starting. That isn’t to say I dislike what I do or find it burdensome. As a matter of pure fact, I love it. What I don’t love, or should I say I didn’t love, was finding out about all the things no one tells you about. It’s the stuff not found in books or magazine articles. It’s more the type of stuff that comes out when seasoned sound guys start telling war stories. And it’s this very stuff that I’m telling you about today. The stories I’m about to mention are true though names may be changed to protect the guilty. Most are stories that happened to me. Others, well, are from sources who would rather remain anonymous. 1. Worst-case scenarios really do happen. There are a variety of worst-case scenarios if you think about it. Mixer dies, pastor’s mic dies, people stop tithing their 10%. Whatever it is, these things happen. But before I talk about preparing for them, I want to tell you a short story and see if it doesn’t send chills down your spine. My friend was mixing the service and everything was going great. There was even another person who was in the sound booth, shadowing him, as part of the audio production learning process. Suddenly, without warning, the equipment in the sound booth shut down, the house speakers fell silent, and the band stopped playing. My friend quickly looked around and realized that the other guy swiveled in his chair and his knee hit a power switch on a floor rack unit. Worst-case scenario and yet a simple solution. So, what do you do about worst case scenarios? You plan for them. The simplest thing I learned to do was to map out the signal flow of all the audio equipment in the room. I’ve done this everywhere I’ve gone and once even found myself re-wiring a system because it was so messed up. When you know how the signal flows, you know where to look when something stops working. Start at the mixer and go backward. Let’s say you stop getting a channel’s output in the house speakers. What does the channel signal meter show? Is it getting anything? If not, check the gain, check the connection, check the wireless receiver, check the stage, check the source. If you are getting a signal, make sure the channel isn’t in a mute group or in some other group that isn’t being used. Check the signal on the amplifier. You get the idea. Learn how the signal flows and you’ll do great. But let me get back to the idea of making a plan. Create plans for dealing with worst-case scenarios. 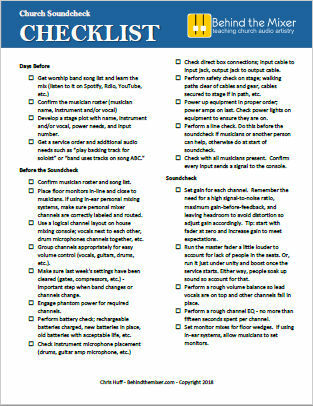 Create a plan for the power going out. Make a plan in case the mixer dies. 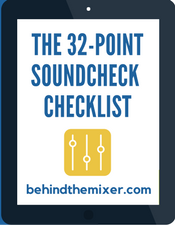 Would you pull in a backup mixer, get one from a youth room, or do something else? Relax – you’ll think clearer. Take a deep breath and then move to step 2. Assess the situation. Look around at what the equipment is doing and what is going on onstage. Don’t assume you know what the problem is. Take in the information and make a plan. Maybe it’s as simple as having another microphone handed to someone on stage. Maybe it’s much more complex. Execute on that plan. If that plan doesn’t work, assess the situation again and make a new plan and execute on it. The best way to deal with these worst-case scenarios is to plan for them. However, if you’re surprised by something you didn’t see coming, then follow that process of Relax, Assess the situation, Make a Plan, and Execute on it. Whether it’s cleaning out the wax from in-ear headphones or wiping off microphones, it’s a dirty job. I’ve had to crawl under places as I waved at the friendly neighborhood spiders. I’ve had to lube up a snake cable to feed through conduit and then pull it out the other end. That one still makes me squirm. There isn’t much you can do about this part of the job other than to accept it. I’ve had techs tell me they had people who wanted to volunteer but only if they mixed. They didn’t want to do the less glamorous work, like stage prep or cleaning equipment. I don’t mind the hard work. I don’t even mind getting dirty. But when it comes to things like cleaning out wax, I just keep one thought in my mind – this is a ministry job and part of my work is serving people. 3. The Shure SM58 microphone makes a handy weapon. What I mean by that is live audio production is stressful. The schedule changes. Things break. Personalities clash. And, there are no do-overs. IT’S LIVE, BABY! There will be days you want to walk out the door. Most every professional live engineer I’ve met has had such a moment. I know one who was so frustrated with the ridiculous demands of the musicians during the soundcheck that he walked out of the sanctuary and almost walked out the church doors. But he didn’t walk. He took a few deep breathes, walked back in and tried to meet their needs, and then only later did he have a sit down meeting with the worship leader to work out the problems. It can be stressful, but that comes with the job. I had a congregation member yell at me about the volume during the church service. I maintained my composure, told him it was within the range the church leadership deemed acceptable and I told him who he could contact after the service. Then he proceeded to tell me he was going to walk to the front of the church and say something. I’m not sure how he was going to do that with the band on stage. I gently but firmly repeated to him who he could talk to after the service. Eventually, he sat back down. Did I think he was being ridiculous? Yes. But I also figured that the anger he had over the volume was rather extreme and likely, he had something else going on in his life. As it turned out, he did and me, the sound guy, was an easy target for his anger. Of course, there’s also the stress of working in a live production environment where we can’t hit pause or call for a redo. All this being said, you need a way to manage your stress. Know what’s out of your control. Don’t worry about the audio system dying if it’s never shown a sign of problems. Learn from your mistakes. Don’t stress over things like “what if that happens again.” Make a plan to deal with it if it does. Know that small mistakes are usually forgotten. It’s easy to stress about a mistake you’ve made, like a missed mic cue but for most little things, the congregation has quickly forgotten about it. Find a mentor or fellow tech for post-service debriefing and venting. Whatever you do, don’t vent when you’re in the sound booth. You’re seen as a representative of the church and how you behave is a reflection on the church. Learn to act and not react. When stressed, we tend to react to things in a way we shouldn’t. Instead of lashing out at someone, consider the situation and what’s best to resolve the problem. Maybe a short-term solution will work and you work with the person later for a better solution. Eat healthy, exercise, get a good night’s sleep, and if you’ve got some deep-seeded problems, seek professional help. I promise you, the older you get, the more you’ll find this last point the most helpful. Bob Goff , author of Love Does has a new book, Everybody, Always: Becoming Love in a World Full of Setbacks and Difficult People. And since we do work with difficult people...need I say more? 4. 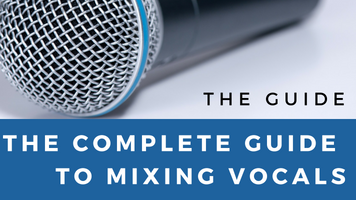 Great mixing doesn’t guarantee great worship. There are days when the band is great and the mix is great and everything seems perfect. Yet, not everyone is worshiping and praising God. 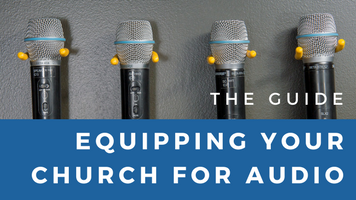 Good audio production creates an environment conducive for worship. That’s ALL it can do. It’s a hard truth in that a great mix doesn’t guarantee a great worship experience but the flip side is really cool; a great worship time doesn’t depend on a great mix. I recall a service when my mix could have been better as it sounded a bit off to me. After the service, I heard someone say how great the band sounded and how much they enjoyed the worship time. Where the Spirit of the Lord is, there will be worship, regardless of the level of production. Let me go a different route with this. I’ve mixed a variety of styles of worship and I’ve been in the congregation for several others. I’m not here to say which was best. What style was great for one congregation wasn’t doing anything for me. To each their own. Moving past style, I’ve seen some small churches with questionably skilled musicians and so-so mixing where the congregation was fully into their worship. Obviously, there’s a greater factor present than the quality of the band or the mix. Can those things impact the quality of the worship? Yes, but they can’t control it. I’ve talked about how audio and video and lighting can work together to create an emotional environment that, in some way, ushers people into worship. A few people said that’s why they hate production because it attempts to create something false. Does it? To that I say no, at least not in a way designed to fool the congregation. For example, walk into a fancy restaurant and they’ll probably have relaxing music on. They want your dining experience to be relaxing. With production work, it’s much the same. Let me wrap this part up by saying our goal should always be to create an audio production that benefits the congregation but it can’t guarantee anything. 5. and this one really bugs me….People talk during the music. Sitting in the sound booth gives me the ability to watch people. I can watch who comes in late and who leaves early. I can see who is texting, playing Candy Crush, or checking Facebook. And…grrrrr…I can watch the talkers. Sometimes, they’re close enough to be heard. The band is playing, people are worshiping, and then a Mr. or Mrs. decides it’s time to talk. I don’t mean, “don’t forget to call your mother.” I mean, “I’m not sure what we should do for lunch today. I was thinking about seafood but then Bill doesn’t like seafood and then Marge, remember Marge? Anyway, she had that outpatient thing last week and that reminds me, did you make an appointment with your endocrinologist? If not, it’s ok because when I stop by the bank on Monday I can… blah blah and blah.” And that’s not a judgement on women. I see men do this as well. Some people just don’t get it. It’s their loss. 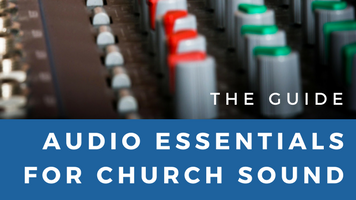 I’ve often said that church audio is ministry work but it’s also the least recognized so for number six, you need to learn to rejoice. The congregation walks in the sanctuary and a short while later walks out. They experience an hour or two of a service while you’ve put in two or three times that in prep work. They don’t know that. They don’t need to. What they need to do when they are there is marvel at the one great God. And they can do that because you’ve done the grunt work. It took over 3,000 people 410 days to build the Empire State Building. This includes installation of approximately 17 million feet of telephone wire. If you walked into building when it was first completed, you’d have seen beautiful carpeting and newly painted walls and shiny windows. But what’s under the carpeting? Subflooring. What’s behind the paint? Drywall and metal.Stuff put up by people doing the grunt work. It’s OK that you’re doing the grunt work behind the scenes because the congregation isn’t there to pay tribute to your hard work, they are present to worship God. Rejoice because God’s using you so people can focus their attention on Him. God sees your service and when you realize your work in church audio production is a partnership with Him then you’ll realize you really are living the Glamorous Life. Great thoughts here! This really puts into perspective that our job is to serve the Lord to enable worship. Thanks, Peter. I’ve got something eles coming up that I think will take that further. 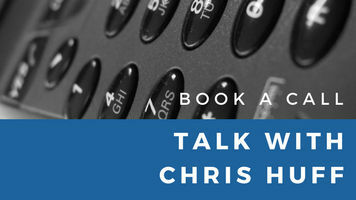 Chris, thank you much for your website for information, experience and venting. Unless you’ve done this, no one can relate! Our first sanctuary had a used snake, powered 12 channel mixer with a 6 channel sub mixer into 1 channel all on the same circuits as the lights with dimmers. One Sunday everything midway through starting worship started to go wrong- feedback, channels dropping, low end growl. The pastor looks at me and gives me the “look”- which would make grown plants die. I stood there with a tears knowing there was nothing I could do. A week later we had a new 24 channel mixer. I did get an apology and a hug too. 2 thoughts; 1) Church budgets when building should have <10% for sound systems. 2) The looks and comments from church staff intimidate potential volunteers. The audio system is a critical part of holding a church service. When that’s not realized, problems are bound to happen. Great to hear you got hugs! Thank you SO MUCH for posting this article! My husband is the main “sound guy” at our church and all of this is so true. I hear the venting when things don’t go well in worship. I am a praise team singer, but I am also intimate with the “behind the scenes” stuff, via my husband. I SO APPRECIATE all the things you “sound guys” do!! Number 4 has been the biggest problem for me the past few years. I’ve done church sound for 20+ years and have a pretty good track record. But there have been some days when I’ve poured my heart & soul into a mix and even though I think it sounds good and get some positive feedback, the worship response is weak. I start to second guess my mix decisions and think I need to do more or change something. At these times a have to remind myself that I can’t replace the work of the Holy Spirit. I’ve done the best that I can do and must leave the rest in God’s hands. I would have to say that the converse is true as well. Having a bad sound day- poor performance from the band- missed cues- does not mean the audience can not worship. I too have been in church sound for 20+ years and surprisingly, when I think it is time to just walk away because I could not do anything to make the band sound good, could not control that one weird ring, couldn’t even get the volume correct, I hear people walking out of service saying ” the worship was wonderful today, I loved the songs and the message.” Sorry for that run-on sentence. The point is, when we are weak, He is strong. God does not need our perfect performance each weak to meet the needs of the congregation. We should strive to do our very best, and in our failures rely on God to fill the gap. When the band worships, the congregation will worship right along with them. When the band is just performing, the congregation will be left behind and that is not a good place to be. Make sure that you are in a place where your performance is made to be Worship to a Holy God first and foremost. Then He will cover all OUR mistakes. I think that’s really appropriate to label it that way for obvious reasons. My most recent “disaster” was due to building wiring issue which I have no control over. It turned out that the kitchen outlets were on the same circuit breaker as the sound booth, main speaker (one of them), projector on the ceiling. On one particular Sunday morning the kitchen staff preparing for end of service fellowship decided to plug in all three large coffee makers at the same time because whoever normally makes it before the service was out that day. So, to make up for the lost time, they get multiple high current drawing coffee makers (10 quart percolator) going at the same time and sure enough breaker trips. Few of us knew where the breaker was so one jumped immediately and turned it back on which results in loud “pop” since the speaker powers on first and the rest equipment comes on later. Now the problem continued since the kitchen staff didn’t realize it was the coffee maker and as soon as the power came back on they again turned on the coffee makers to “brew”. Again, power goes out as the worship team got started back up. Now repeat this two more times (with accompanying pops each time) and finally I went back to the kitchen and asked what was plugged in (just in case, and I guess right) and I explained to them what was going on. Thankfully they resulted to boiling water on gas stove and pouring the water over the coffee and service went on without a hitch after that. Now there is a gigantic posting inside the kitchen that states no coffee makers can be brewing as soon as service starts. But, I agree with Jim Smith’s comment about us being invisible when we are at our best. If I am doing what I am supposed to be doing, no one knows that I am doing anything. (except God) I think that’s essential. The congregation came for a worship service and that’s what they need to do; not pay attention to what the guy in the sound booth is doing. When I know they were focused on God rather than the sound guy, I know I’ve done my part during the service. HAHAHAHAHAHA…. [breathes]….HAHAHAHAHA And that’s just as the thought of the three coffee makers going. I love a great war story! I think you meant “assess” the situation, not “access”! PS -Are you using speech to text software? Whoops. I’m not sure what I was thinking – I know the difference! Thanks for pointing that out. I fixed it. And no speech-text software. I used something close to that for when I recorded the podcast and then formatted it for the article. How true it is! We all have our “horror stories” of things that go wrong. My guess is we are the only one’s that remember them. So here’s one of my stories. Biggest production ever for the kid’s Christmas Play. Live band, lights, multiple wireless stuff. Rehearsals all went as expected. On the first and only performance, the band fires up with the first tune and WOW low end feedback like the end of the earth was near. The subs were doing their thing! Since we were less than 20 seconds into the show, I just shut it all down. Went to the amp rack and….sure enough someone had actually loosened the cover on the dbx drive rack and changed it to the Disco smiley face setting (the room has a serious low, low-mid problem anyway!!) I stood in front of the congregation and just told them that we needed to stop and reboot the “magic box”. We all had a good laugh and restarted the play. Needles to say, the following week some serious screws were put into the cover. The sound “guy” is the last person in the chain between the band, the speaker and the congregation. When we are at our best , we are invisible. Nothing gives me greater pleasure in church than to see the congregation join in worship. Really, isn’t that what it’s all about.